Halloween is still a long time away, but that doesn’t mean you cannot make early preparations for said festival, right? 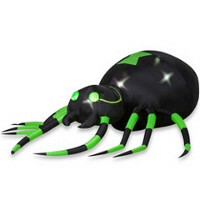 Hammacher has a bunch of Halloween-themed stuff for you to part your money with, but the 7′ Animated Black Widow is one of the more interesting ones, being an inflatable arachnid that is capable of turning its head automatically in a deliberate, calculating manner as though it was stalking its prey. As any self-respecting arachnid ought to be, the spider comes with eight legs in total accompanied by menacing fangs and a bulging abdomen which ought to make some kids pee in their pants when they go trick-or-treating at your doorstep. Made from durable tear-resistant nylon, the spider won’t go anywhere thanks to a quartet of stakes and tethers. This $79.95 arachnid needs to be plugged into a power outlet to keep it going, and is immune to pesticides and other insecticides.